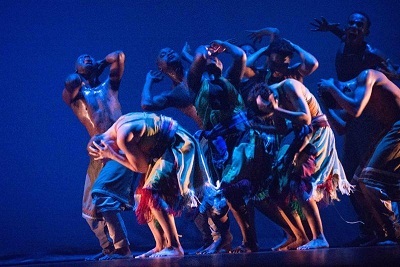 The Playhouse Company has become well-known for their dance residency that allows dancers the space to make challenging choreography on the body. Their latest marvel is Ukuzinza, meaning rooted, choreographed by the noteworthy Mzokuthula Gasa. Gasa brings a fresh ferocious energy into the 10 dancers, all of whom must be commended for their strength, speed and stamina. I relished in the images and poetry of the movement that reminded me of what joy it is to be African and even through our hours of struggle and turmoil, we have much to celebrate. The opening gave birth to multitude of images. We were swept across the wild planes of Africa with sounds and pictures of animals, then transported to the hustle and bustle of city life. The sound of cattle horns herded us into this fierce world and held us captive as the dancers twirled, twisted and trampled across the stage with such pace and poise. We were reminded that while we are different, in Africa, it is our differences that pull us together. There was a myriad of styles, techniques and solo showmanship at hand yet they all meshed together into a tight fisted dance work. It was an amalgamation that was a true reflection of what Africa is like. We were privy to African contemporary, ballet, tribal dance and so much more. I was impressed by many of the dancers on stage as they embraced their own technique and allowed this choreography to nudge them out of their comfort zones. They dug deep to find the spirit of Africa within them and dance a united front. I was mesmerised by the dance work and the connotations of Africa that were brought up and as the opening image of the umbilical cord suggests, Africa is within us all. A well-earned standing ovation.